This sexagenarian legend is a time capsule of the bygone borscht belt era, when shtick could make up for cramped quarters, surly waiters and shabby tables. All of the gargantuan sandwiches have punny names: “Bacon Whoopee” (a BLT with chicken salad), “Carnegie Haul” (pastrami, tongue and salami). A waiter sings the deli’s virtues in a corny video loop, and more than 600 celebrity headshots crowd the walls. Still, when you’re craving a deli classic, you can’t do much better than the obscenely generous pastrami and corned-beef sandwiches on rye. The place might not have invented schmaltz, but it certainly perfected it. 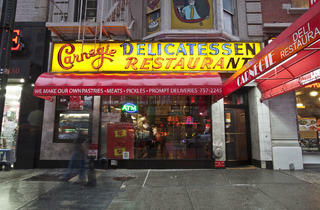 As Carnegie Deli is closing their doors this week, I decided to walk by for take out (typically a quick process). As I approached there were two lines: one for dining in and one for take out. Each equally long - estimated as a two-hour wait! I got tipped off that Postmates delivers and decided to try it out. It ends up it's a delivery service where someone else orders for you rather than an app like seamless where the restaurant takes your order directly. It's now been almost an hour and a half since ordering, but at least someone else is waiting in the line so I can enjoy one last meal from them! If you happen to go this week I love the matzah ball soup with noodles, the jumbo latkes with apple sauce, and the pastrami/meat knishes. The sandwiches are simply too much to handle in my opinion, but go big or go home if you're up for a sandwich as tall as the buildings around it. 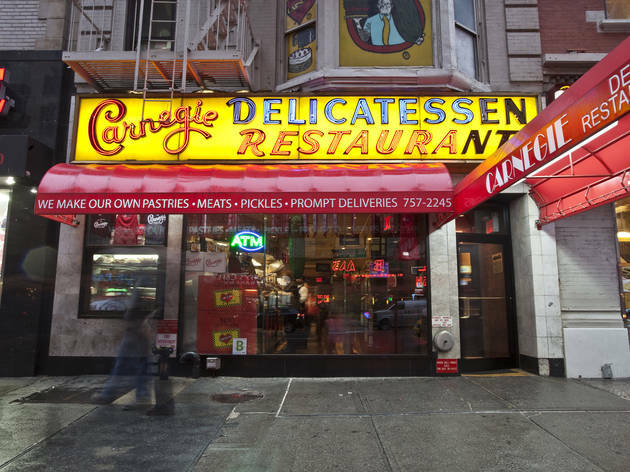 Just a stone's throw from times square - this icon serves up classic, old-school deli creations piled high. The food is filling, the atmosphere is mediocre, and the service staff is slightly worse. There is a novelty appeal to seeing the place, with pictures plastered everywhere, all amid the hustle and bustle. The food itself is hearty, heavy and served in massive quantities (though also a bit pricey). The staff will certainly leave you alone if you'd like to stay there all night, which can be nice, but at times it's tough to catch their attention, and then, it may be with attitude. Sometimes tabletops are sticky or unprepared, but overall it is a suitable dining experience, and even more so, a memorable one. I’ll be honest: I only order one thing from Carnegie (and no more than once a month because I want to live past 45), and you can probably guess what it is: the hot pastrami on rye. This tottering mountain of brined beef, barely kept vertical by two slices of bread and best shared with that special someone, is a New York staple for a reason. Sure, I wince at the $20 price tag, but I’m basically getting two sandwiches in one, I can split it with a friend of my wife. Make sure you get pickles with it—the sourer the better. The matzoh ball soup is very good, but I hate taking up space that could be used for delicious pastrami. Usually I order it to go (avoid the lunchtime or dinnertime crush by going after 9pm), but the few times I’ve eaten in have been pleasant and rich with Noo Yawk atmosphere. Of course that atmosphere is mostly on the walls in the form of framed photos. Let’s not kid ourselves: the place is a tourist destination.